Do you enjoy high-activity hobbies such as rock-climbing, parachuting, cliff diving, stunt biking, or snowboarding? If you do, perhaps you also would enjoy recording your adventures in real-time. Live-action cameras do just that- they allow you to record what you're doing as you're doing it and share your adventures for the world. There are many live-action cameras on the market, and one of those cameras is the Contour +2. Contour as a company has come out with many live action cameras, each with its advantages and disadvantages. As they have received feedback, they have upgraded their live-action cameras. In this review, we will look deeper at the Contour +2 live action camera and discuss its features, specs, and pricing. We will also compare it with a few other live action cameras on the market and see how it measures up. The Contour +2 is Contour's live-action camera that allows for recording of activities or sports as they happen in real-time. 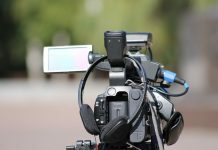 It is a nicely-designed video camera that allows for both mobile and stationary filming. 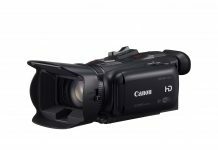 It can film all footage in HD and is a reasonable price of around $500. With Bluetooth capabilities, excellent video quality, and easy-to-use features, the Contour +2 is a good camera for your live-action filming needs. 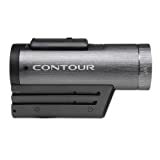 The Contour +2 live action camera is dark gray, tube-shaped, and measures 3.86 inches by 2.36 inches by 1.34 inches. It has a raised rubber switch on top of the camera for activating the camera. A new feature with this switch is the lock feature, which prevents accidental activation of the camera during transport. Right in front of the power switch is a small Bluetooth button to connect the camera to a smartphone. The lens itself is a six-element glass ultrawide-angle HD lens with a 170-degree field of vision. It has a 270-degree rotating barrel with a red LED-light projector for leveling the lens.It also has a new video-capturing mode called Slow-Motion or SD Mode that captures video at 480p up to 120 frames per second. All the videos are taken in MP4 format and are still encoded with the H.264 codec with AAC audio compression.You can use this app to upload your videos directly to Contour's website, Contour.com, as well as Vimeo and YouTube. You can even share your video on Facebook and encode the GPS overlay onto your videos on Vimeo and YouTube instead of just on the Contour website. 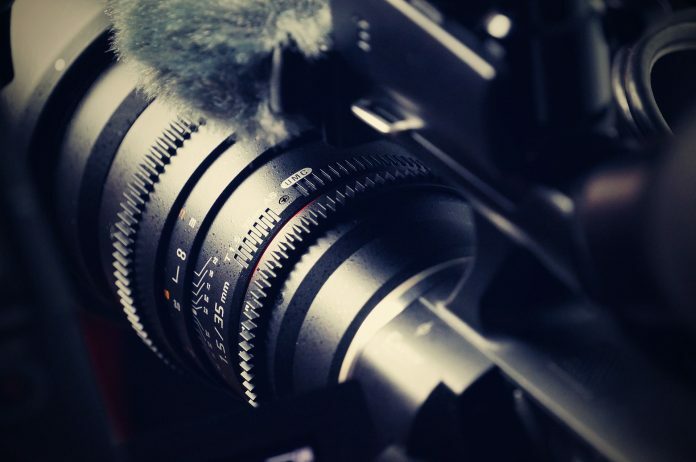 On the bottom of the camera, there is a rubber cap that houses a microphone input as well as a square-shaped piece with rails on the side that can be used for mounting. This makes it ideal if you want to mount the camera on a tripod and film from a stationary point, or if you want to attach it to such areas as bike handles, surfboards, skateboards, etc. On the back of the camera lies a door that contains a status button, which illuminates color-coded status lights for memory space, battery level, and GPS lock. It also has rubber flaps that serve as pass-throughs for the Mini-USB and HDMI ports. If you open the door, you will find a microSD card slot, a removable and rechargeable battery, a format button that deletes all data from the SD card, and a bi-mode switch. The Contour +2 comes with a good amount of accessories. Included in the box with the camera itself is two cables, an HDMI cable, and a microphone extension cable. It also comes with a rotating mount with a safety leash and two adhesive pads as well as an adhesive low-profile surface mount. The packaging is rounded out with a 4 GB SD card, a Contour vinyl decal, a waterproof case, and a rubber lens cap. The clear, plastic waterproof case works up to a depth of 60 meters, upping the ruggedness of the camera. It used to be charged as a separate accessory, but Contour has included it in the original packing for the Contour +2. Having these accessories included for the price range of $500 makes this a pretty good deal for a live-action camera and allows you to start using it right away, which is convenient. The Contour +2 has a variety of video-capturing modes. This includes Full HD (1080p at 30 frames per second), Tall HD (960p at 30 frames per second), and Action HD (720p at either 30 or 60 frames per second). It also has a 5MP sensor, which can capture still photos at 1- to- 60-second intervals. The Contour +2 is compatible with Contour's ContourConnect app for Android and iOS devices. Instead of using Wi-Fi like most cameras, the Contour +2 uses Bluetooth. By pressing the Bluetooth button in front of the power switch mentioned earlier and initiating pairing in your phone's menu, you can link the camera with your phone via Bluetooth. The ContourConnect app allows you to see the battery level, card capacity, and GPS signal status. With its latest update, the app also allows you to see your video live and start or stop your feed remotely. You can also browse and even preview the video feed that was stored on your SD card right inside the app. The Contour +2 also has a built-in GPS called ContourGPS that records all the location information while filming. You can then use the desktop Storyteller app to overlay GPS information onto your video. The Contour Storyteller app for Mac and PCs was developed so that you can import video captured with the GPS data onto your computer. The GPS data includes elevation, speed, and path. You can then use this information to edit and trim your videos so that only the best parts are highlighted. With all of these apps and software included, the Contour +2 is definitely a live action camera worth buying for your filming needs. Contour states that the battery life for the Contour +2 is typically around 2-2.5 hours. Tests have shown the camera to get around 1.5 hours of battery life, which is still really good for a live action camera, especially one with extra features. As is typical with live action cameras of this caliber, the Contour +2 can be purchased for around $300. Various other outlets, such as Bonanza or Walmart, may sell it for a lower price of around $400. The MSRP is only about $300 to 400, which is really good compared to previous generations of the Contour. However, this is more expensive than most other live-action camera brands. Though it is expensive, this is a good price range because of the accessories, as well as the superior mounting system and improved ruggedness of the camera compared to its previous generations. This product is around $300 to $400 in amazon. This camera has a unique and sleek design with protective flaps, a mounting area, and a high-quality lens system. With four different video-capture modes and a still photo mode, this camera provides excellent video quality. The camera typically reaches 1.5-2 hours of battery life, which is good for this type of camera. The Contour +2 comes with everything needed to start filming, access to great apps and software, and now includes a waterproof case in the original packaging. The GoPro Hero5 Black contains all the shooting options from the GoPro Hero4 Black with the best video and photo quality. It is very small and square, convenient for mounting on equipment for filming. It also includes a touchscreen and a waterproof and dustproof body. It also has a housing case that is good for depths up to 60 meters and costs around $200 with an MSRP of about $200 to $250. The GoPro Hero5 Black includes a simple filming system. Instead of having a three button system like its predecessor, it has recording button on top with simple instructions- press it once to power the camera up and start recording and press it again to stop recording and turn it off. It also has a small shooting mode button on the side that can be used as a power button. 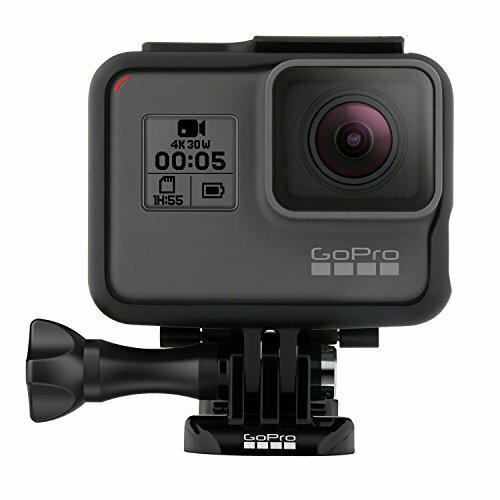 The GoPro also includes features such as voice control and stereo audio. 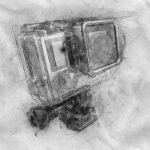 There are three microphones on the back of the camera, and it will automatically switch between them to provide the best audio possible, providing a hands-free experience. This camera can capture video at up to 4k resolution at 30 frames per second and 1080p at 120 frames per second. 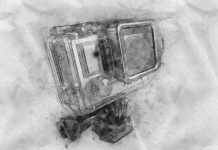 A new linear-view setting that corrects distortion in wide-angle videos and photos and electronic image stabilization (EIS) have also been added, though they are limited in the resolutions and frames per second available. It has built-in GPS as well. It also includes a cloud service called GoPro Plus that will automatically upload your videos and photos to the service when you plug it in, and it only cost $5 per month. If you don't feel like editing, it also gives you access to video-editing apps Replay and Quik, which will find the most exciting highlights of your video for you and trim away the rest. It will even add effects and transitions and sync them to the beat of whatever music you pick. There is also a desktop version of Quik available. However, to be noted is that the camera has a short battery life of only 1-1.5 hours, so you may need to bring an extra battery if you want to film more than a couple of clips. Because this is a new model, you can not use your old batteries with it. This product is around $200 to $250 in amazon. 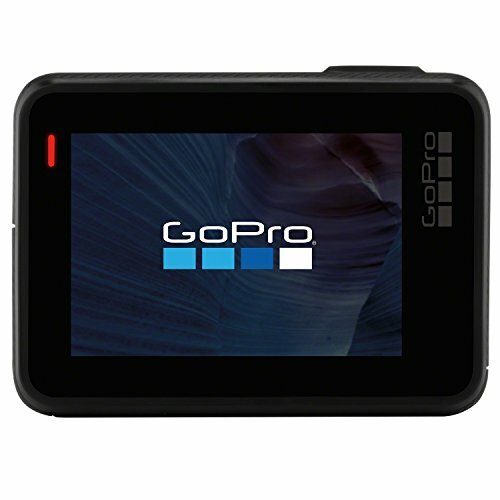 The camera is a convenient size for live action filming and includes a touchscreen. It can shoot up to 4k resolution and has a linear-view setting with a new EIS feature. The battery life is typically only up to 1.5 hours. The GoPro provides access to convenient software. 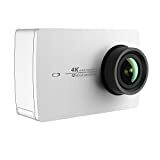 The YI 4K Action Camera is a small, square camera that can record high-bit-rate video up to 4k resolution at 30 frames per second. It includes a touchscreen on the back and sells for roughly $100 with an MSRP of about $80 to $120. YI constantly updates their firmware, adding filming options and improving performance. For example, the camera includes a flat color setting that makes adjustments easier and an Ultra resolution setting that can stretch a 4:3 aspect ratio video to 16:9 for a full-screen view. It also can take time-lapse video, slow motion, loop, and even capture time-lapse photos and record videos at the same time. The YI 4k Action Camera also includes EIS, lens distortion correction, and an auto low light setting. It can connect to your phone via Wi-Fi and YI's mobile app, allowing you to view, transfer, and edit your videos easily. It has an average camera life of roughly 1.5 hours. However, this video can lack video clarity, wiping out highlights and not correcting chromatic aberration in high-contrast videos. It only comes with the camera, a micro USB cable for charging, and one battery in the original packaging. Waterproof housing costs $40 extra, and you'll have to pay for any other accessories like mounts or SD cards. This product is around $80 to $120 on amazon. The camera is very small and compact with good software options. While it can record up to 4k resolution, it can lack video clarity. It has an average battery life of 1.5 hours, which is good for a live action camera. The Samsung Gear 360 is a white, small, spherical 360-degree camera and is considered one of the best on the market, selling for around $80. It has a small screen with three buttons on the camera to change basic settings and switch between four modes: Photo, Video, Looping Video, and Time-lapse Video. Once you find the mode you want and press the record button, the camera will capture the view from the rear and front of the camera simultaneously and combine them into a JPEG photo or an MP4 video. It can wirelessly connect to your Galaxy device and allow you to preview the photo or video, and also comes with a timer for photos. Once connected, you can transfer your photos, and it will stitch them together into a 360-degree spherical view. These can then be transferred to YouTube or Facebook or the high-tech Gear VR Headset. 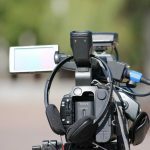 The Action Director software allows you to edit your videos and provides many more advanced features than other editing software programs. The Samsung Gear 360 comes with an included tripod/handgrip so that you can easily hold onto its otherwise awkward spherical shape. The battery is removable, and it can record to SD cards. However, it is only available with select Samsung phones and only works well with Windows editing software, making it difficult for the general public to use. You also have to keep your videos short as it takes it a long time to put the photos or video together into one spherical view. This product is around $70 to $100 on amazon. Very difficult to use without the tripod included and no housing to protect it. It does not get a high resolution with just one camera. It has an average battery life for this type of camera. Comes with a tripod for holding and a battery, only Windows apps. 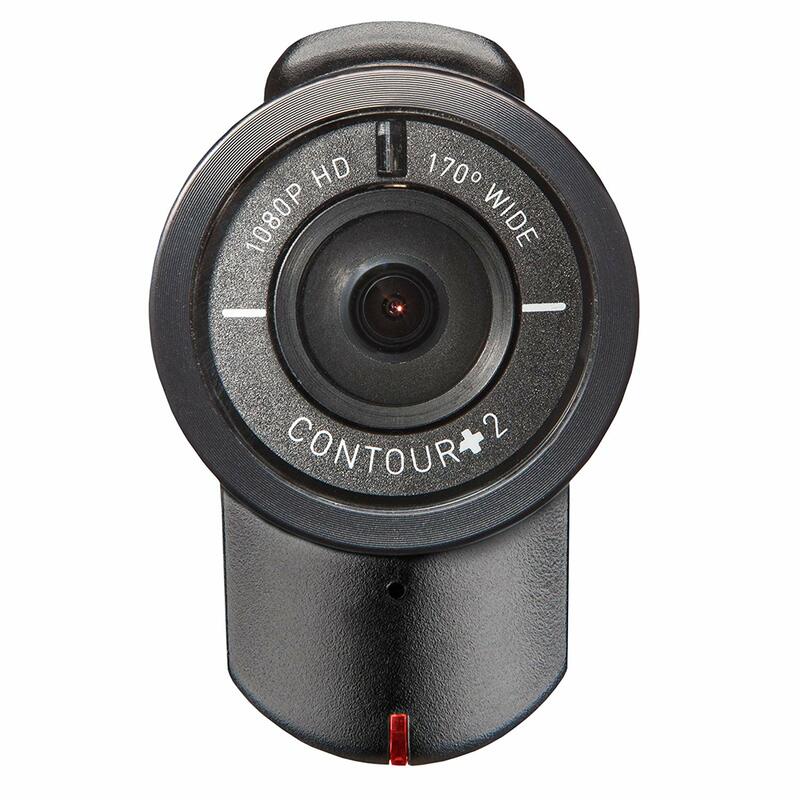 Overall, if you're looking for a live-action camera that is easy to use, provides access to a lot of software and applications, has great video quality, and can be mounted virtually anywhere, then the Contour +2 just might be for you. It is a little more expensive than other cameras, but well worth it when you consider the great features and accessories you have access too. For our final verdict, we give the Contour +2 live action camera 4 out of 5 stars. The Contour +2 has an excellent video quality and good battery life. However there's no viewing screen on the camera.